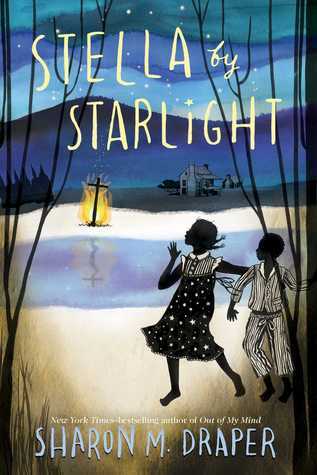 I love Sharon Draper's books and Stella by Starlight has great buzz, but I went into reading it with apprehension. Stories about the post-Civil War era are so upsetting to me, so I kept waiting for the scenes that would break my heart and leave a residue. There were a few. How could there not be when the first page features a cross being burned by the Ku Klux Klan? Stella lives with her loving family in segregated Bumblebee, North Carolina. Draper does a great job portraying the family as a tight group who take care of each other. They'll need to do so now that Stella's father wants to register to vote and the Klan doesn't like it. 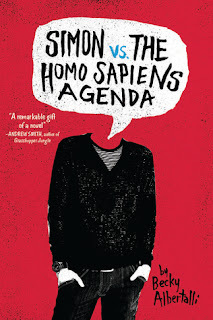 I'm curious to know if any of my students would read this on their own. If it was a read aloud, they would be glued to it, but independently, they need more frequent hooks. I haven't had a patient reader for a few years, one who could sit this this book as its story unfolded. Still, I'll book talk it and keep it in mind if I'm ever teaching this historical era. 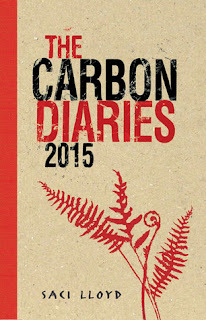 I saw a random recommendation on Twitter for The Carbon Diaries 2015 and I decided to check it out. I'm glad I did because it is a really fascinating look at how climate change could affect London. I advise the Eco Club at a Green Flag Eco School, so this interests me, but even if you aren't an environmentalist, it's worth reading. Told from the perspective of caustic teen Laura, we see how quickly global warming can destroy society. 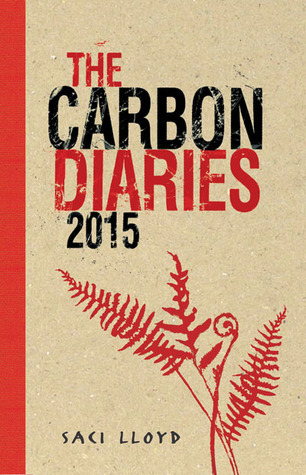 In the "future" 2015, the British government decides to impose a 60% reduction in carbon emissions, through the use of carbon rations. Laura starts out feeling irritated with the restrictions, but then the drought begins, and then the floods, then the cholera, and so on. Laura needs to grow up quickly, and so do we if we are to avoid this fate. I loved how the environmental disasters unfolded in the background and then became the focus. It reminded me of another favorite, Life As We Knew It. 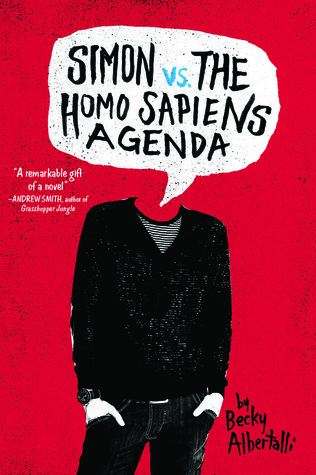 While it skews mature for my sixth graders, I would recommend it for 8th grade and up. Even better, there is a sequel set in 2017. My goal is to read it before that date. This year, I'll be teaching a unit on the solar system for the first time. I like to balance what my students need to know about a subject with what they want to know. 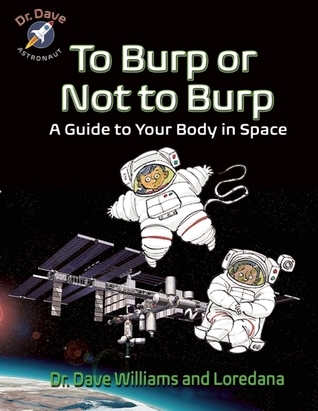 To Burp or Not to Burp will answer many of the questions that they have. The bold ones will ask them aloud and the shy ones will wonder, but they will all be curious about how the body functions in space. This picture book gives a lot of great information and taught me a few things that I had never considered. I now know how astronauts sleep in space and understand better why they have to do so much exercise on the International Space Station. It's a good supplement to textbooks. All I'll need to do is display the book prominently, and I can see it being passed around the class by everyone. Best of all, it had me thinking of other questions which aren't covered in the book, like if the astronauts hair and nails grow at the same rate in space and do astronauts get the flu in space. The best nonfiction gets the reader wondering, so I'm excited to begin our inquiry with Dr. Dave Williams' book. Tom Angleberger's feelings about standardized testing always comes through in his books, much to the delight of all the teachers who are in agreement with him. Fuzzy takes this to the next level, fully exposing how ludicrous it is when schools become obsessed with achievement at the expense of student welfare. Max is excited when she is chosen to partner with the school's new robot, Fuzzy. The goal is to help him become similar to a real middle school student. But as Fuzzy becomes more human, the school's evil digital evaluation system takes notice and sets out to stop them, no matter what it takes. I love Tom Angleberger's writing and it was fun to read something focused towards slightly older readers than his incredible Origami Yoda series. 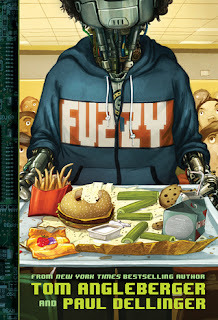 Fuzzy is funny and clever; it would make a great read aloud which could lead to some interesting discussions about the testing and assessing culture in our schools.